One API Gateway instance only. This is the default. Multiple API Gateway instances in a group, each API Gateway instance on different hosts, with a Cassandra storage node local to each API Gateway host. High availability with remote storage Multiple API Gateway instances in a group, each API Gateway instance on different hosts, with Cassandra storage nodes on remote hosts. Note You can use one Cassandra cluster to store data from one or multiple API Gateway groups and one or multiple API Gateway domains. Your Cassandra topology does not need to match your API Gateway topology. Multiple API Gateway groups can also be deployed on the same host, each host running an API Gateway instance for each group. This applies to both local and remote storage. You can continue using an existing remote Cassandra installation running on Windows that you have configured with your API Gateway installation. For details on hosting Cassandra in datacenters, see Configure API Management in multiple datacenters in the API Gateway Installation Guide. Cassandra is configured in non-HA standalone mode when deployed alongside a single API Gateway instance on the same host (for example, in a demonstration or development environment with one API Gateway instance). This is the default mode. Ensure Cassandra is installed on the local node (along with API Gateway). For details, see Install an Apache Cassandra database in the API Gateway Installation Guide. Start Cassandra before starting API Gateway. For details, see Manage Apache Cassandra. Start API Gateway. For details, see the API Gateway Installation Guide. In a Standard or Complete setup that includes the QuickStart tutorial, the default configuration attempts to connect to Cassandra running on localhost. In a Custom setup without the QuickStart tutorial, you must configure the connection in Policy Studio. For more details, see Connect to API Gateway for the first time. To use Cassandra with API Manager, see Configure a highly available Cassandra cluster. This is configured by default when API Manager is installed along with the QuickStart tutorial. To use Cassandra with OAuth, see Deploy OAuth configuration in the API Gateway OAuth User Guide. 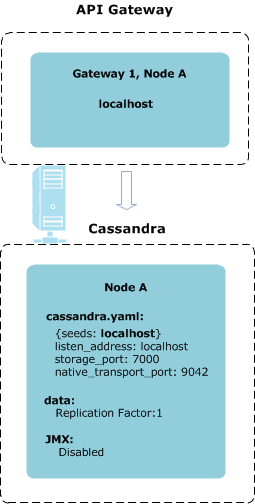 For both local and remote Cassandra HA, Cassandra runs on multiple hosts. This section describes both scenarios. In local Cassandra HA, Cassandra runs alongside API Gateway on the same host. This means that you do not need to provision separate host machines for Cassandra and API Gateway, or open ports in your firewall. However, the data will be stored in the DMZ. Local Cassandra HA enables minimum cost of ownership. Note In this example, one of the Cassandra nodes runs without an API Gateway instance on the same host. This is because the minimum deployment architecture includes two API Gateway hosts and three Cassandra hosts. 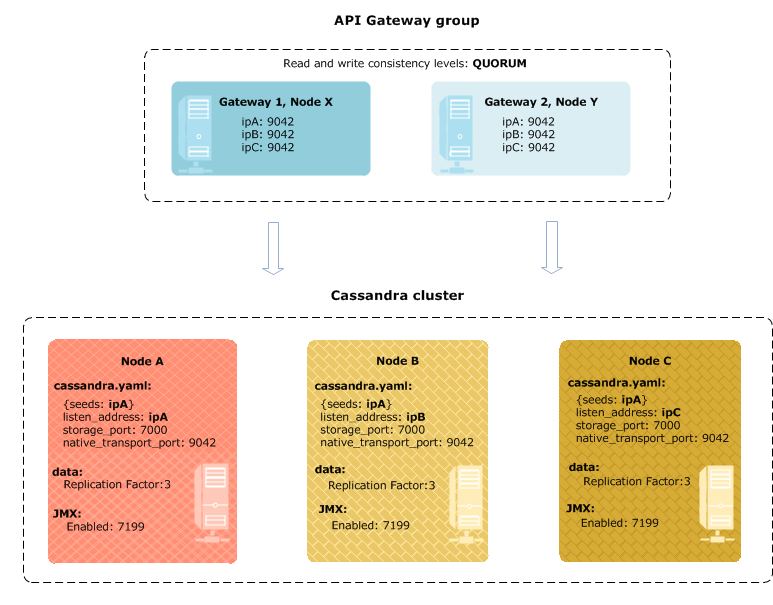 If you have three API Gateway instances, all Cassandra nodes are local. You must provision separate host machines for Cassandra and API Gateway. However, the data can be stored outside the DMZ, and there might be improved performance. You might need to open ports in the firewall to connect to Cassandra outside the DMZ. For more details, see Configure a highly available Cassandra cluster. You do not have to use the Cassandra component supplied by the API Gateway installer. You can configure the remote node using the setup-cassandra script supplied by the API Gateway installation. For more details, see setup-cassandra script reference. Alternatively, you can perform all necessary Cassandra configuration changes manually. You must update the API Gateway Cassandra client settings in Policy Studio to connect to the remote Cassandra host nodes. Three Cassandra nodes in a single cluster. Three host machines with network addresses: ipA (seed node), ipB, and ipC. Replication factor of 3. Each node holds 100% of the data. ipA, ipB, and ipC are placeholders for real host machines on your network. You can specify IP addresses or host names. You must have at least one designated seed node. Seeds nodes are required at runtime when a node is added to the cluster. You can add more or change designation later. You can change the server-server port, but it must be the same across the cluster. For Cassandra administration, you must gain local access to the host machine (for example, using SSH) to perform administration tasks. This includes using nodetool to access the Cassandra cluster over JMX. 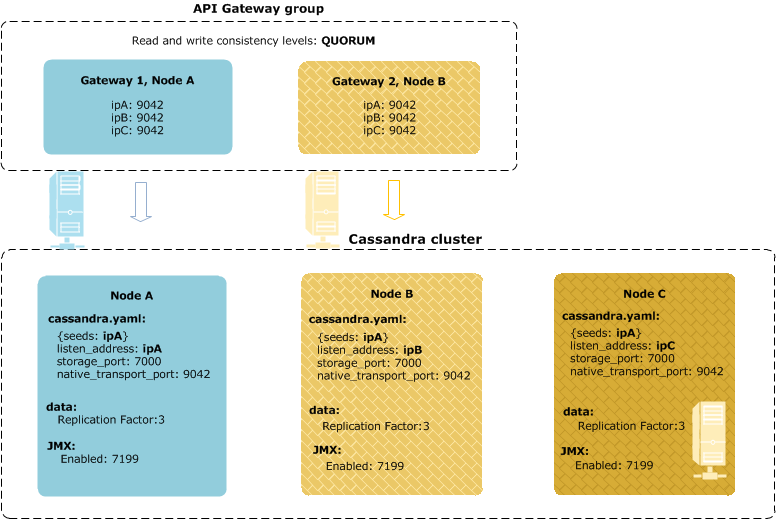 API Gateway can fail over to any of the Cassandra nodes for service. Each API Gateway is configured with the connection details of each Cassandra host. Cassandra read and write consistency levels are both set to QUORUM. This, along with the replication factor of 3, enables full availability in the event of one node loss. Note You can have any number of API Gateway instances (all running either locally or remote to Cassandra). However, you must have at least two API Gateway instances for HA. This also applies to API Manager. For more details on Cassandra HA configuration, see Configure a highly available Cassandra cluster.